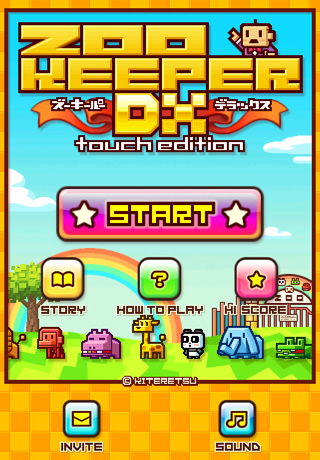 ZOOKEEPER DX TouchEdition « KITERETSU inc. The definitive action puzzle game "ZOOKEEPER"
is finally available on iPhone! Game Center support! Compete for high score with people all over the world! Become the best of zookeepers! Required OS version iOS4.2 --> iOS4.1. Fixed the frame position (This happened only when the language setting was NOT in Japanese). Fixed disabled touch action in the title picture. Reduce memory usage to prevent from crash when starting. Advances to next stage if you catch more animals than target. Catch 100 animals and advance to next stage! Devoted mode without stage limit. New features will be available by FREE updates!